Treat dad to this fantastic Porterhouse steak recipe. 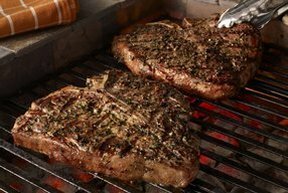 The garlic herb peppercorn crust adds awesome flavor to a great steak that dad is sure to appreciate. Grill it just the way he likes it for a special Father's Day meal he will love. Learn the difference between direct and indirect grilling; then find out when it is best to use each of these methods. Find step-by-step instructions and tips on how to grill great tasting shellfish.